Fall is probably my favorite time of year for fashion and clothes. I love Summer weather but I really loooove fall fashion. Fitness clothes even fall under fashion for me too! Because when you are feeling confident in your fitness attire, you're walking around a little taller, a bit more pumped up and willing to give that extra push. Today is a great example of how you do not have to buy the most expensive fitness clothes out there to look chic and still be in good hands. I was always a Lululemon snob, until my good friend introduced me to Zella at Nordstrom. (Zella even comes in Plus sizing which I feel is fabulous too!) Zella is a wonderful brand and very durable, comfortable and comes in an array of fun prints and colors. However, recently I was in Old Navy cruising their Active section and found myself taking some of these above items straight into the fitting room-9 months pregnant and all. (Old Navy even has a great selection of Plus Active too!) Old Navy is definitely giving everyone out there a run for their money with fitness clothing at a fraction of the cost. The Old Navy compression capris are seriously amazing! They fit great on the booty, go up high enough for the muffin top area (or not) and even come in tall which I got so they still look like a normal capri on those of us close to 6 feet. Plus with all the coupons, rewards and if you use your Old Navy Card on Tuesdays you get 10% off, my pants were like $7. Ummmm that was a $91 savings from a pair of Lulu's... Eek! I have all of the Old Navy items above even the shoes and I have to say those are comfy for a gym shoe too. I wear different shoes according to what my workout of the day will be. I wouldn't run a half marathon in them but they do the job for a cute athletic shoe if you like to have color variety and do not want to drop $100 a pair. I am super in love with the gray dome gym bag from Target and think I may have to pick that little guy up. I feel super obsessed with gray this fall amongst purple and burgundy too. Can you tell I am in workout mode? Now if this little girl will make her debut so Mama can get her booty back in gear and Work It Out-all will be good!!! I love athletic clothes too! 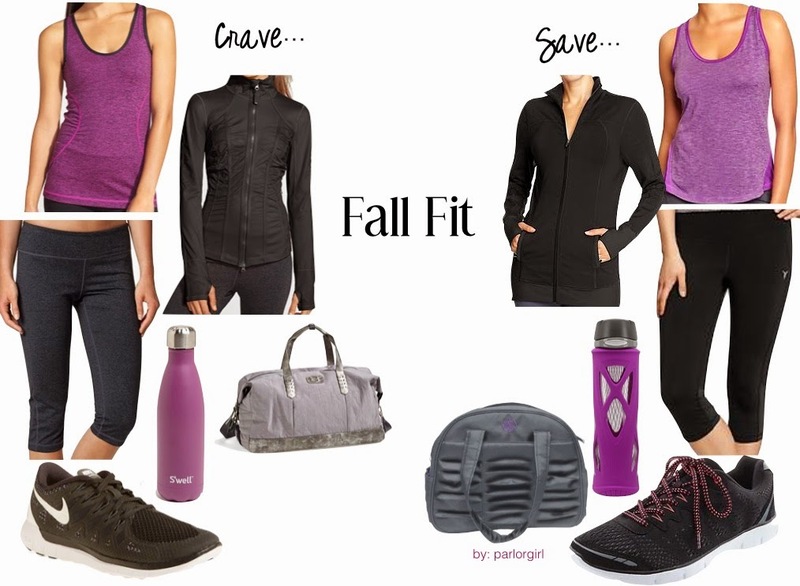 The purple and gray is a perfect fall color combo!